Since my first float trip down Joseph Creek last year, I have looked forward to doing a second trip. 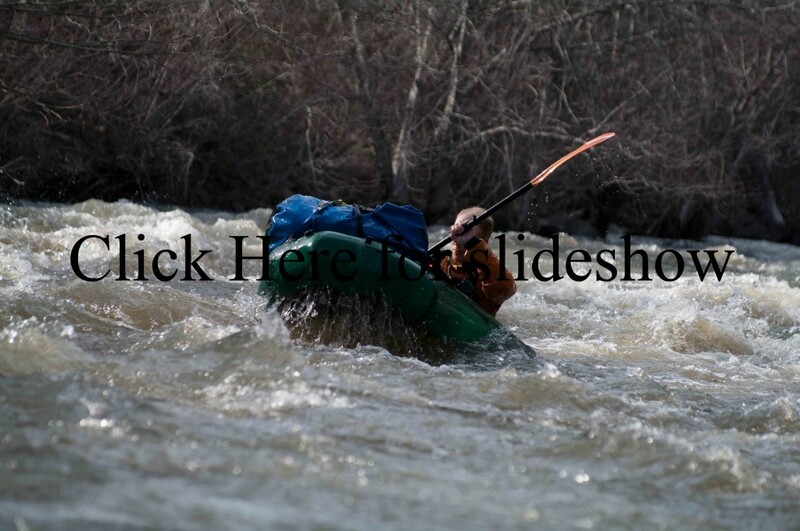 The first trip was in inflatable kayaks at 200 cfs. It was a fun and challenging trip, but I wouldn’t want to float it lower than that and the access point we used was not the most convenient. Since purchasing two NRS packrafts last fall, I have only taken them on one test trip on a short float down the Wenaha. The packrafts held up OK and I thought a really good test for it would be Joseph Creek. 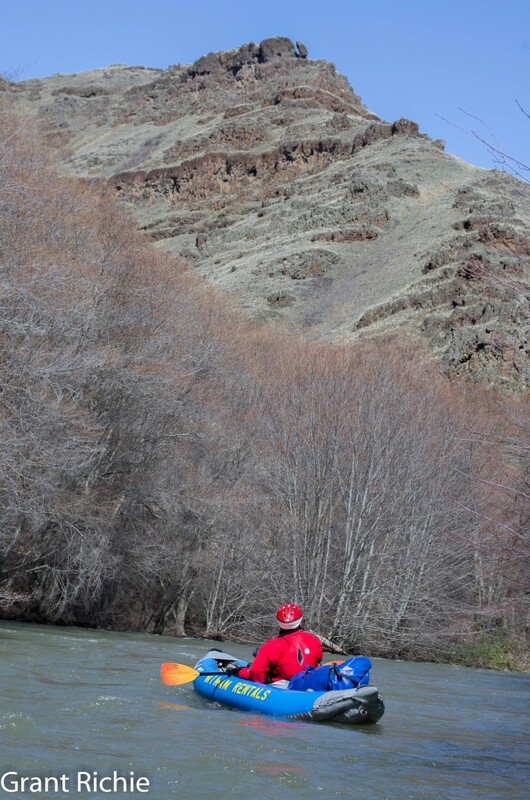 The water is continuous and challenging with a few rapids approaching class IV and what better place to hike in a small inflatable boat than a 2,500 foot deep canyon. I wanted someone to go with me and I thought my chances of convincing Jeff would be best if I could get an inflatable kayak down ahead of time for him and then I would take a packraft for myself later. Joseph Creek had its first spike on the charts in mid March and my wife, kids, and I headed out on a Sunday scouting trip to see if the road to the Warm Springs Trail was good. I loaded up five packs figuring that Lottie, our 3 boys, and I could pack almost everything down so that if flows cooperated Jeff and I would have everything staged for a float out the following weekend. I kept the kids packs super light for the hike down and they would only have water to pack on the hike out. The day did not go according to plan and we weren’t to the trailhead until early afternoon. If I went down with the kids I wanted plenty of time so they wouldn’t have to be pushed on the hike out. 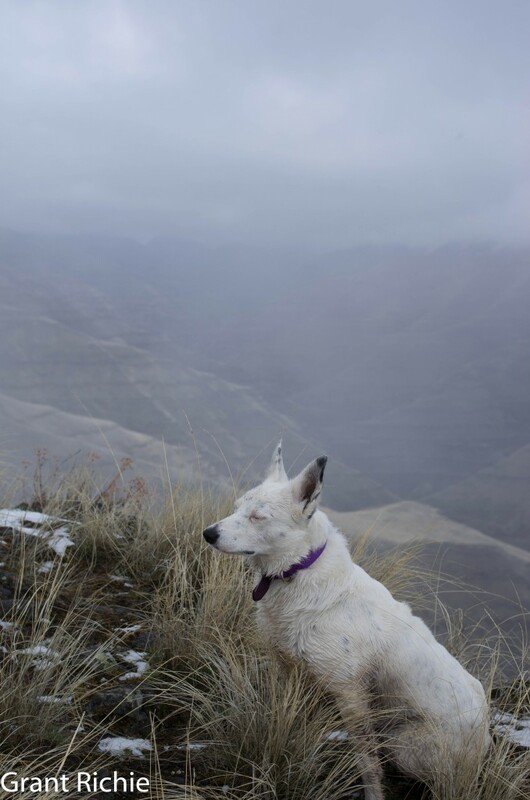 I have taken them on lots of hikes building them up to steep ridges that gain close to 2,500 feet in a mile or two. When we began a few years ago it was a real challenge for them, but now I often wish they would slow down a little. I knew they would have no problem hiking into and out of Joseph Canyon. The first good news was that the road to the trailhead was passable by car. When we arrived I still wasn’t sure if we were going to make the hike down or not and I thought we should walk down the trail a little ways and have a look first. There is a wire gate at the trailhead and Mason tried to open it in a very odd fashion. I wasn’t looking until I heard him give a yell out. Apparently he stood in the fence line with his face behind the piece of wood that was wired to the post. Normally a person pushes on the piece of wood with one hand to put slack in the wire loop that is holding the gate closed. Then you can take your free hand and lift the wire loop off the piece of wood and let the gate down. Mason however grabbed the wire loop with both hands and began jerking it up over the piece of wood until the gate was free and smacked him in the face. I did not notice what he was doing until he yelled and blood began pouring from his nose. After he calmed down I had to deduce what happened from the clues he gave me. We then took a moment to demonstrate the right way to open a wire gate so it doesn’t smack you in the face. Of course an adult would not be hit in the face. At my height, if I had opened the gate the same way I would probably be wounded severely as well, but the injury would have been inflicted on a different body part. Now with a late start and Mason already bleeding badly at the gate, I did not feel it was the right time to take the boys on their first hike all the way into Joseph Creek. I thought we should simply walk down the trail a little way and have a look around. I forgot the camera after Mason’s bloody encounter with the gate and frankly missed out on taking some really good pictures. We hiked a good two thirds of the distance into Joseph Creek anyway and other than a bit of mud, the trail wasn’t too bad. We made our way back up the trail and I pointed out the wild onions that like to grow all over in the rocky soil. After everyone gave them a taste test the boys decided they should pick a couple to take home. Back at the car we all got in, everyone except Mason that is. He stood beside the car waiting for his brothers to get in with his hand on the car body between the two doors. Lottie got in and swung her door shut. Mason then hollered out “OOOOWWWWWW!” and gave his mother a disgusted look. Lottie looked surprised and then asked, “What? Is your hand in the door?” Mason replied by saying “YEEESSSSSS!” Poor Mason. He was getting beat up right and left. At least he didn’t do somersaults down the hillside in the rocks. After the throbbing in his hand subsided he was able to laugh about the beating he had taken that day. After we got home I continued to watch the flows. Jeff and I were both a little concerned and we decided we would choose 600 cfs as a maximum flow with no significant rain forecasted while we were supposed to be on the water. During the intervening week it rained hard several days in a row and a lot of new white stuff was appearing in the mountains. Then three days before our possible float the satellite that relays flow data for most Eastern Oregon rivers went out. Normally this would not be a big deal, but Joseph Creek is remote, hard to get to, hard to get out of if something went wrong, challenging to float, and I didn’t want to kill my friend off if the flows had spiked up to 2,000 cfs and I convinced him to go with me even if we didn’t know the flow. Jeff and I’s tentative float was for Saturday and Sunday. The website with streamflow data said the satellite might be up by 10 am Friday morning. The plan was for me to hike in gear Friday if the flows looked good and Jeff and I would hike in Saturday and float out by the end of the day Sunday. Friday morning at 10 I still had no streamflow data but decided to hike an inflatable kayak in anyway. I was worried that new snow on the road might not allow my car to get through so I decided to take my pickup. There was 4”-6” of new snow and I was glad that I had my pickup and four wheel drive. My car may have not made it to the trailhead. I was feeling unsure about our trip but decided to start hiking down with the inflatable kayak and gear. The snow disappeared after losing some elevation and soon the snow turned to a light drizzle and then to a beautiful sunny day. I was now glad I did not turn around at the top. Scanning the canyon I saw a black spot that appeared to dark to be a rock or a tree stump. I squinted my eyes and waited for the black spot to move. It didn’t so I kept on walking, keeping my eye on the black spot waiting for the spot to reveal itself as the first spring bear in the bottom of the canyon. After making my way down the canyon some distance the spot became slightly elongated and I knew it was a black bear for sure. I began to curse myself as I had brought a telephoto lens with me but left it in the pickup telling myself it was too early for any bears to be out and it would simply be unnecessary weight. Making my way down the ridge I had to make a decision: go down the right finger towards the bear, a path I had not taken which kind of looked like it ended at a cliff or take the finger of the ridge that led to the left where I knew I could get down and stash my kayak for the float out the next day. I chose the sure path to the left thinking that I would swing back by the bear on my hike out and see if there was a hikeable path and hopefully get close enough for my wide angle lens to get a recognizable picture of the bear. Taking the path to the left meant I lost sight of the bear pretty quickly but my last sight of him had him heading down the creek towards me so I was pretty confident I was going to get a closer shot. I found a nice nook on a small rock bluff just above the creek that felt like a safe distance off the creek from any hungry spring bears willing to taste test anything including an inflatable kayak. It was also a long ways from the trail and no reasonable person would have any reason to hike there. Feeling my gear was safe for the night I headed upstream to find my bear. As I was walking up the canyon I was also scouting the creek trying to decide if the flows were OK for Jeff and I to safely float. I was feeling pretty comfortable with what the creek looked like although I was up the canyon wall a little ways which made it look smaller than it really was. About a quarter mile upstream of where I left the kayak a helicopter appeared out of the blue and buzzed the canyon. There goes my chance of getting a picture of my bear I thought. I had never seen any helicopters buzzing the canyon before so it seemed a little odd on top of it being annoying. My bear was gone. I walked straight across from where I had spotted him before but I am sure the helicopter made him run for cover. I got home fairly late but there was a small blurp of data on the streamflow chart showing Joseph Creek to be flowing a little above 700 cfs. The blurp was so small I couldn’t tell if the creek was going up or down, but it hadn’t rained hard for almost a day and the weather forecast looked especially good for the weekend. I called Jeff and we decided floating Joseph Creek was a go. Saturday was filled with many delays and we didn’t get to the trailhead until afternoon again. There was still some snow at the trailhead but it disappeared quickly once we started down the trail. My bear was in the same location and I was happy that I was going to get a chance at a good picture this time since I packed my telephoto lens. I watched the bear as we hiked down and was going to head down the right path this time, but he meandered off up the canyon into some brush and never reappeared. Once to the creek I began to feel a little uneasy about my NRS packraft being able to make the float out of Joseph Creek at these flows. Jeff was game though and we inflated his kayak and my packraft. I felt a little jealous as I looked at the kayak. I was feeling like I didn’t want to be the test dummy. We started our float anyway and the packraft felt like a flimsy pool toy. I was not feeling overly confident in my packraft and Jeff’s kayak was sailing through the rapids with ease. I asked him if he would mind carrying my drybag until I got the feel of my packraft again. We strapped my drybag into his inflatable kayak and away we went. I felt much better without the extra weight of the drybag and began to feel more confident in the NRS packraft as well. We only floated about 3 miles on Saturday before we had an hour of light left. We had stopped and scouted everything very cautiously and portaged one corner that was blocked by three different log jams. We made camp on a beautiful small meadow with several caves across the creek. 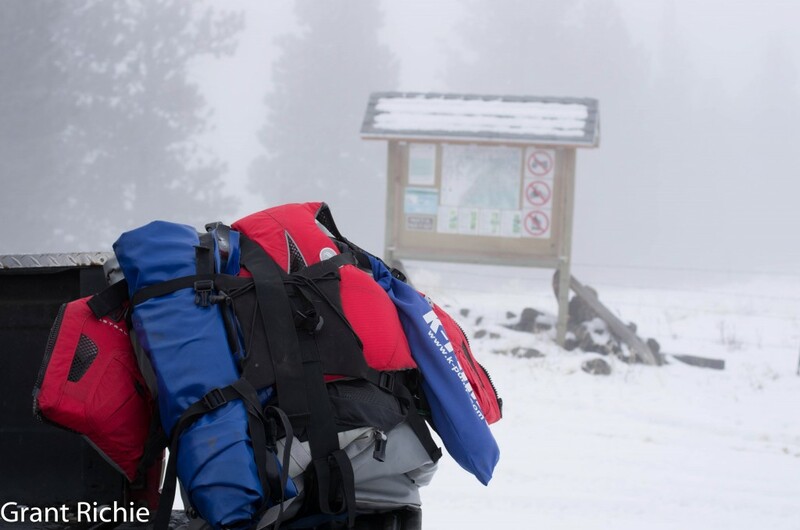 The first three miles below the Warm Springs Trail were a good confidence builder for my packraft and the next morning I strapped my drybag back onto the front. To be sure, the first three miles were a nice warmup really. The rapids became longer, harder, bigger and more continuous. Jeff did a great job being the lead man and handled all of the rapids in his inflatable kayak. The two other write-ups I have read on floating Joseph Creek call it up to class IV or approaching class IV. The two days we were on the water the creek was running between 650 and 700 cfs and there were a couple tough spots to be sure. The first bigger rapid is below the first beaver pond. The pond is somewhat natural, but the beaver has certainly helped maintain the pond. There is a big boulder midstream and last year I remembered it having a log resting on it blocking one side. I scouted downstream and found there was a clear path but was not comfortable taking my packraft through it. The NRS packraft does not have a selfbailing floor like the inflatable kayak and does not have a sprayskirt like some packrafts. As a result I had to pull over often to dump the water out. This first rapid was big enough and long enough that I thought I would be swamped and sunk by the end of it so I portaged and Jeff ran it. Jeff handled it like a pro in his IK. The rapids in the lower canyon are continuous class III with few breaks and as mentioned before, some of the rapids are in the class IV range. The alder and birch trees that line the bank are often whipping you in the face as well and wood is a constant concern. We eddied out in the trunks of the birch and alder multiple times because we could not see what was coming next. There was a second smaller beaver dam with a pretty tough spot through flooded trees. The main current was on river right with a narrow chute. The chute had a rock wall on the right and tree trunks angling and pushing you into the rock wall to the right which lead to a boulder and big hole that was almost unavoidable. The chute was narrow enough that getting a paddle in the water would be difficult, especially with low lying branches. You might be able to navigate through the tree trunks on the left and come in below the narrow chute. I scouted first and then Jeff and I paddled close to the bank on the left and got out and walked our boats under some trees back to the main current around the beaver dam. This was the only spot Jeff portaged besides the trio of log dams upriver. From this point there were no complete barriers and Jeff and I paddled the rest without portaging. Beware though, below the second beaver dam is a tough rapid. You come around a corner where there are big waves in the center, big jagged rocks on the left and tree trunks on the right. The worst part is how low the branches are. And even worse is that there is a big branch that can rip you right off your kayak or packraft. I vividly remembered this spot from last year as it was challenging even at 200 cfs. 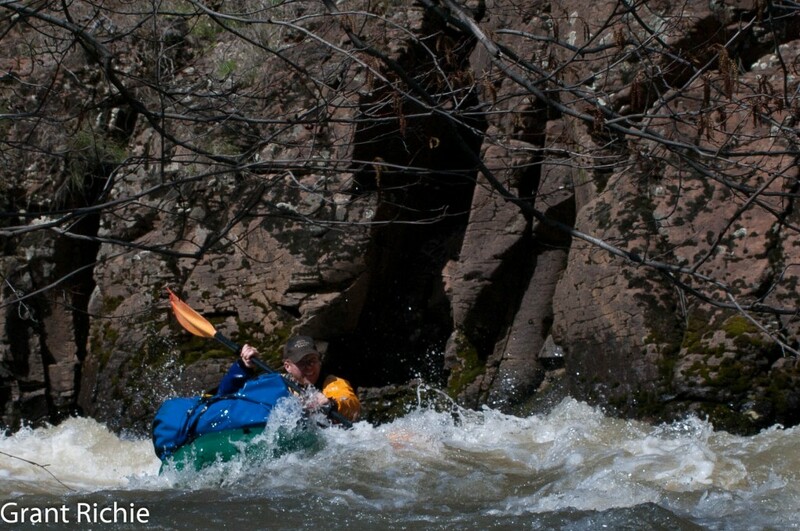 At 650 cfs I came around the corner and was being pushed towards the jagged rocks. I paddled hard to the right to avoid the rocks and went slightly too far. I tried to recenter down the chute to avoid the tree trunks I was heading towards on the right. I managed to correct myself and stay in the middle but not in time to get my body and kayak paddle laid flat to avoid the big branch. The small branches tangled my arm and paddle as I tried to lay down and the big branch caught me and nearly threw me out the back of my packraft. Jeff told me he didn’t get quite low enough either and took a good blow to his helmet which cracked the plastic. There was also a tree that was mostly fallen but not so low that you couldn’t go under. This tree will probably block the creek this year or next. Joseph Creek is beautiful , but tough and challenging to float . . . especially in a packraft. I was paddling much harder to get the packraft through the same water Jeff was taking the inflatable kayak. The packraft was filling up constantly so I was working even harder to find the least splashy paths in hopes I could make it a few hundred feet further before I would have to bail out my packraft again. The more water you get in the packraft, the worse it responds making you work harder still. NRS is supposed to be coming out with a spray skirt this summer and that would make it much better. Our takeout was at the Chief Joseph Wildlife Area just across the road from the old schoolhouse. My GPS said it was 21 miles from our put in at Warm Springs to our takeout at the Fish & Wildlife parking area. I however only made it about 19 miles in my packraft. At the mouth of Cottonwood Creek, Joseph Creek returns to civilization and a public road. I could see the bridge just a few hundred feet ahead of me when my packraft began to lose air and sink. I paddled to shore but couldn’t get off the creek because of the blackberries. Jeff took my drybag and I laid on the packraft and kicked downstream occasionally touching the bottom until I could see a path through the blackberries and to the road. One good thing about the NRS packraft is that there are two main chambers, an inflated seat, and an inflated floor that doubles as an air mattress. With only one tube going flat I was able to ride it down downstream to a better takeout spot. Jeff paddled downstream to our vehicle and I began walking down the road. There were a few people riding 4 wheelers that didn’t seem to be bothered by me packing a limp packraft and zoomed on by. Then a rig or two passed. I then passed two men standing beside their pickup and trailer who were waiting for the other people on their four wheelers. They laughed at me and asked where my patch kit was. Now I did have a patch kit, but with only a few miles left I didn’t want to take the time to patch the raft. Walking was simply faster. I explained this to them and kept on walking. After walking a mile and half in my drysuit, a young man who had been hiking offered to give me a ride the last half mile. Thank you unnamed person. I am glad there are some people with common decency still. It does not bother me to walk. I like walking, but it does bother me that many people are selfish enough not to offer to help. Now the embarrassing part. With my packraft inflated in my living room, I can’t find a leak anywhere. There are two small valves on the inside of the packraft that you can use to top off the air chamber. The valve must have opened just enough to create a small leak. When I had my back against the blackberry bushes on Joseph Creek and a rapidly deflating packraft in my hand I tried to find the leak but couldn’t quite tell where it was leaking from. Instead of looking longer I made a quick decision to hand my drybag off to Jeff and us the remaining air to belly float downstream to a better escape route. It goes without saying that if I had farther to float I would have got to a good spot and inspected the boat until I found the partially opened valve. But with only a 30 minute walk to the van, I assumed walking would be much faster than locating a small leak and trying to fix it. What can I say, the NRS packraft passed another major test. 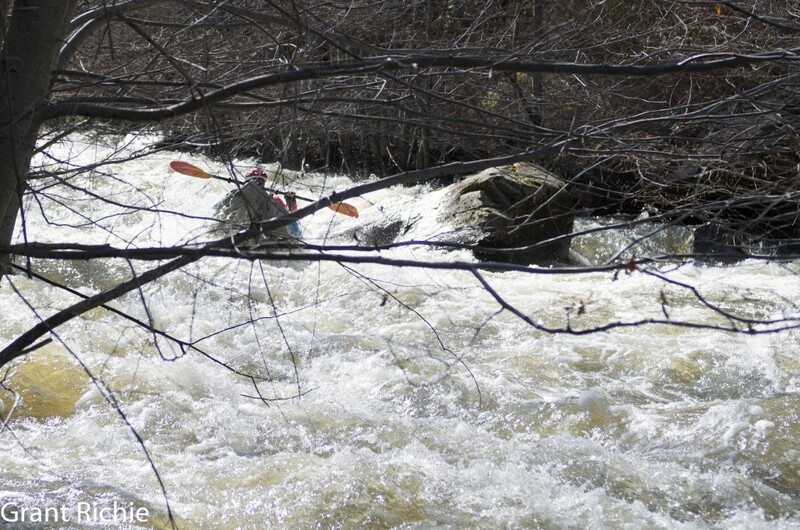 It handled 19 miles of continuous class III water with a few rapids approaching class IV. I would still be more comfortable in an inflatable kayak and I can’t honestly say that I want to float Joseph Creek again in the packraft. I did it and the packraft made it, but I will probably try to get a kayak down there next time. Class II water is much better for the packraft and does not require constant bailing out. 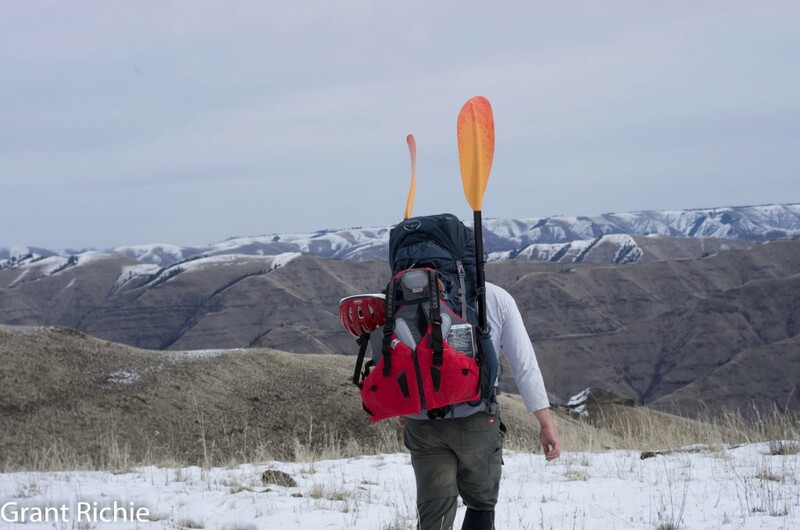 This entry was posted in Joseph Creek, packraft. Bookmark the permalink. Thank you for allowing us to enjoy a little vicarious adventure. Great pictures! Can’t wait for summer. Thanks Bob. I am looking forward to summer as well. Thanks for sharing another great uncommon adventure Grant! With a little imagination, some hard work and daring you show us how much fun is out there in our own back yard….and no crowds to fight at the put-in! Yeeha!! Thanks Dan. My list of things and places I want to go in our own backyard exceed my time every year. Given enough years, I hope to widdle that list down. Joseph Creek does not officially begin until the confluence of Crow Creek and Chesnimnus Creek. This is mostly north and slightly east of Enterprise. Joseph Creek runs into the Grande Ronde about 4 miles upstream from the Grande Ronde’s confluence with the Snake River at Heller Bar. If you drive north from Enterprise on Highway 3 you can stop at the Joseph Creek Viewpoint and look down into the canyon from there. Anyone can contact me by emailing grant@fishingandhiking.com I guess I should put that on the site somewhere. Thinking of visiting Joseph creek next week. 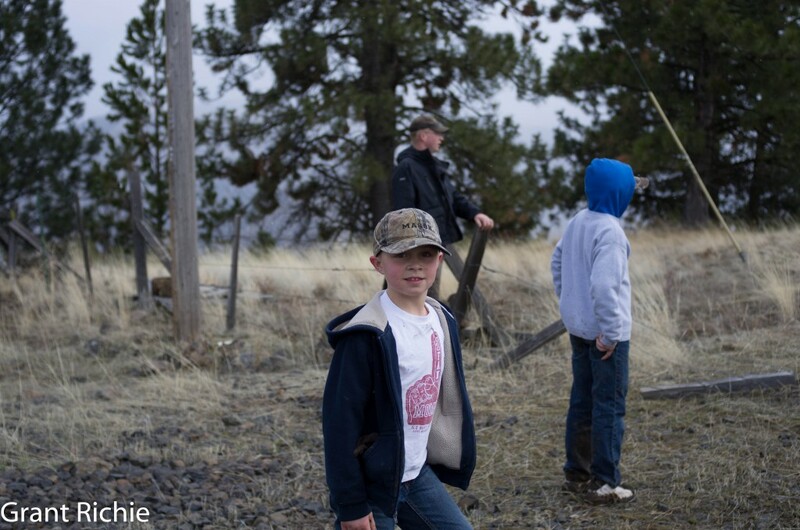 Given the low snow pack this year, would the water level be enough for the fishing to be worthwhile? Fishing should be fine down there.